Dubai: Arsenal’s determination to make the most of their short stay in Dubai was clearly evident after the 22-member squad trained at the Nad Al Sheba (NAS) Sports Complex barely hours after landing here late on Thursday. 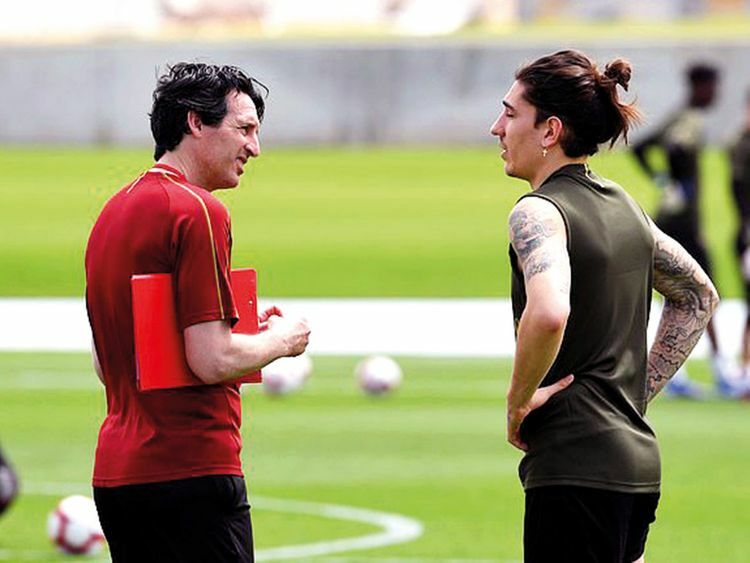 Coach Unai Emery put the players through a training session at Pitch 1 of NAS Sports Complex between 12 noon and 2pm on Friday, after which they returned to their hotel at the Dubai International Financial Centre (DIFC). Most of the support and technical staff had landed in Dubai earlier on Thursday, while the coach and players were welcomed with roses later in the night at the Terminal 3 Majlis by Emirates and Al Nasr officials led by Ahmad Al Khoury, vice-president, Al Nasr Club Board of Directors. All 22 players filed into the Majlis VIP lounge at T3 in matching white-and-blue training gear just before 9pm on Thursday. Captain Laurent Koscielny was first in line, followed by midfielder Mesut Ozil and several first team players, including goalkeeper Peter Cech, star striker Alexandre Lacazette, promising youngster Ainsley Maitland-Niles and recent signing Denis Suarez. Also in tow were injured teammates Danny Welbeck and Rob Holding, who have been in recovery since November and December, respectively. A general sentiment around their Dubai visit is that their stay here will boost players’ morale, who can take advantage of 30-degree weather while temperatures dip to as low as 2 degrees in London. Arsenal are scheduled to play a friendly against Al Nasr to formally open the Dubai club’s newly-built Al Maktoum Stadium, at 5.30pm next Tuesday [March 26]. Emery is using their week-long training camp to prepare his team for the remainder of the season starting with Round 31 of the EPL against Newcastle United, on April 1. During the course of their stay, the Arsenal squad is scheduled to visit the palace of Shaikh Hamdan Bin Rashid Al Maktoum, Deputy Ruler of Dubai and UAE Minister of Finance at 4.45pm on Sunday [March 24] followed by a visit to the Rashid Centre for People with Determination at 9.30am the following day. Tickets for the friendly against Al Nasr have been priced at Dh100 (Category 3) and Dh150 (Category 2), and are already selling fast on Platinum List and at the venue in Oud Metha, Bur Dubai.